Apple Will Build $1 Billion Campus in Austin, Adding 5,000 Jobs The tech company says the move is expected to make it Austin's largest private employer. The city already has more Apple employees than anywhere else outside the company's headquarters in California. 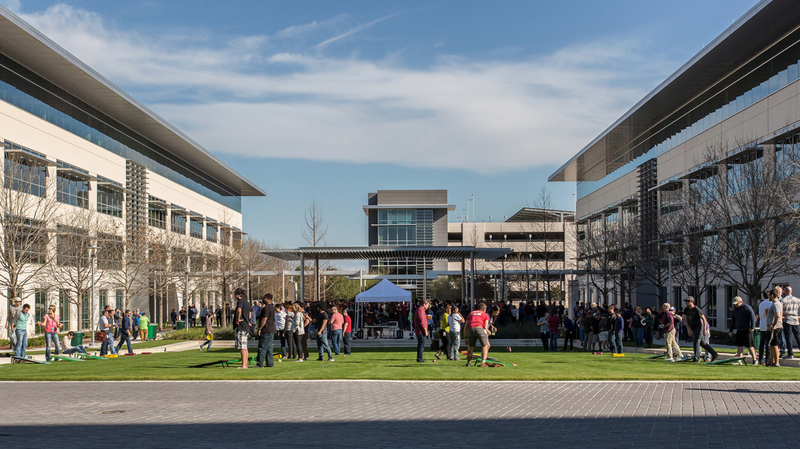 Apple's ambitions in Austin took another step in 2013, when Cook confirmed rumors that the company was building its new Mac Pro computers in the city. The new jobs in Austin will cover a broad swath of its business, Apple says, from engineering and research to business operations, sales and customer support. The employees will work on a large campus that the company says will include 50 acres of preserved open space. Welcoming news of the expansion, Texas Gov. Greg Abbott said, "I thank Apple for this tremendous investment in Texas, and I look forward to building upon our strong partnership to create an even brighter future for the Lone Star State." Apple, which employs 90,000 people in the U.S., says that over the next three years, it will also "establish new sites in Seattle, San Diego and Culver City" and add hundreds of new jobs in cities from Pittsburgh, New York and Boston to Boulder, Colo., and Portland, Ore.
"Talent, creativity and tomorrow's breakthrough ideas aren't limited by region or ZIP code," Cook said, adding, "With this new expansion, we're redoubling our commitment to cultivating the high-tech sector and workforce nationwide."